There have been many text editors on iOS over time, from iA Writer and Daedalus Touch, to Pages and Microsoft Word (unofficially, mind you). When someone asks me which one they should purchase, the answer is far from simple and usually begins with a question. I mean really, it all depends on what you need, not “what’s the best” since there are lots of different types out there. First, there are true word processing apps like Pages that aid many a student and writer of manuscripts in completing their work. But then there are the simple, yet beautiful and nicely-featured distraction-free editors like iA Writer. If you really like these, then you’re in luck because in this article I’ll tell you all about the great Byword that has recently come to iOS. Keep reading for the full review. 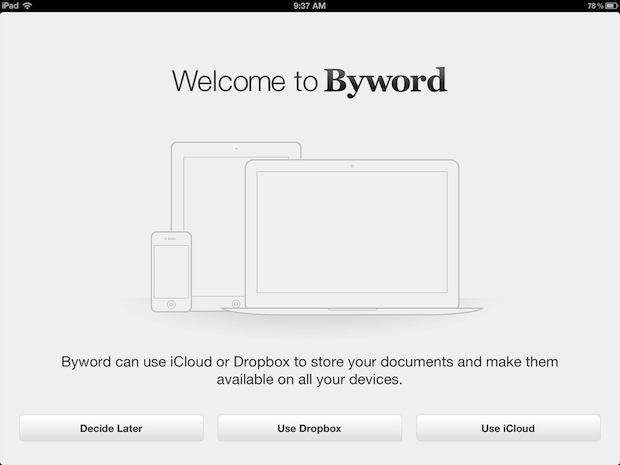 This is the first thing you'll see when you open up Byword on an iPad. 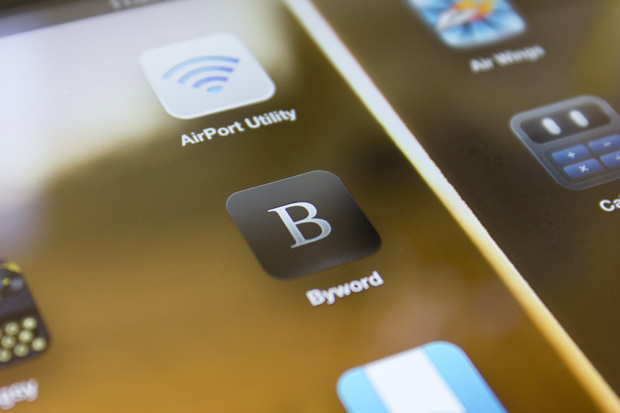 I’ve found that the easiest method to begin writing with Byword is to just use iCloud since there are much higher chances that you already have that account set up on your device and it will only take a mere second to configure. However, if you wish to continue without any cloud syncing whatsoever, just tap the “Decide Later” button and you can configure a service at any later time. Now that you’ve passed the setup process and are into the app, consider reading the “Welcome” document to get acquainted with your new Markdown editor. It’s not very long and has some useful tips for beginners, but it does not offer any information on the Markdown language – if you need some, it can be found on the creator’s website. It’s rather easy to begin a document in Byword. All you have to do is slide the current document – if you have one open – to the right and tap the little “+” button; an alternate method to access the documents menu is to tap the small list-like icon in the top left corner. All you have to do now is type – your document will automatically be synced with whichever service you configured at the start. All you have to do is log in on another device and you’ll find all the words you’ve been typing there as well. If you want to change things up, tap the little gear in the top right corner of the app and head over to the preferences menu to choose from four fonts: M+ C Type–1, M+ M Type–1, Helvetica, and Georgia. 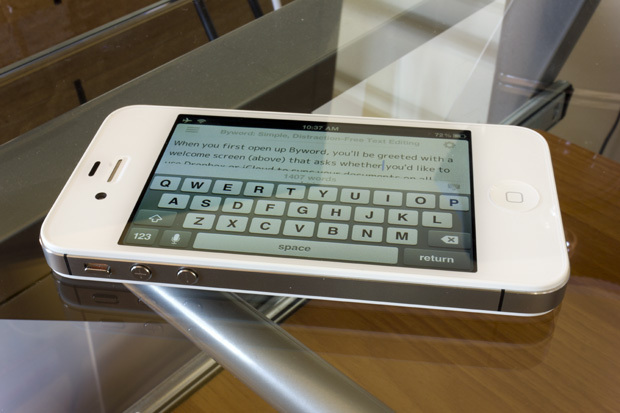 You can also enable or disable spell checking, autocapitalization, autocorrection, and TextExpander in this menu. Some of the other options in the tools menu include a Markdown preview function that allows you to see what your document will look like in rich text, an export function that will let you send your document as an email, export as HTML, or copy the HTML to your clipboard; and a print function that uses AirPrint to wirelessly send the documents to a nearby printer. You may have noticed that there’s a special little row above the regular iOS keyboard, that’s Byword’s special keyboard for Markdown. It actually works extremely well since you don’t have to tap the “. ?123” key just to go get quotes, parenthesis, brackets, and other useful characters. In addition, it has some little arrow keys that will prove to be useful if you need to move around more precisely. If you’re a beginner, then the special keyboard will aid you in inserting a header, list, link, or image. One problem with it is that there’s no option to insert anything but a header 1, which doesn’t help much if you want something else. I suggest the developer adds a feature that will allow a tap and hold for more options. For the link and image insert features, you’ll find that Byword automatically pastes your clipboard as the link and directs the cursor to the area where you are supposed to insert a title. Alternatively, to insert a link, you can select a piece of text and then tap the link button to link that selection. By now you can tell that I really like what the people at Metaclassy have done with their Mac app on iOS. Even though it works well at doing most things, there are still some features from the desktop version that I’d really like to see come to this one. Below is a short list of them. Night mode: On the Mac version of Byword you can change the color scheme to a dark one that pretty much inverses all the text and colors of the regular theme. It’s a lot better on the eyes and is especially good if you’re going to be writing in low-light situations. I’m rather surprised this feature isn’t included, but I’m sure they have it in the plans eventually. More fonts: Right now, Byword for iOS has four fonts to choose from, as I mentioned above. The Mac app offers five fonts, only one of which is available in the iOS app. I’d really like to see others like Cochin, Baskerville, and Helvetica Neue make their way to the iOS app sometime in the future. Customizable width: Another feature that the Mac app has – so does Elements, another Markdown editor for iOS that I reviewed last year – is the option to choose how wide you’d like your document to be when composing it. I’ve found this to be rather useful, even though I almost always use the wide option. On the iPad I could see this becoming something like a dual-paned editor that allows two documents to be open at once, expanding the possibilities for some advanced users. One of the panes could even be a live preview of the rich text. Option to hide counters: I can’t stress this one enough. 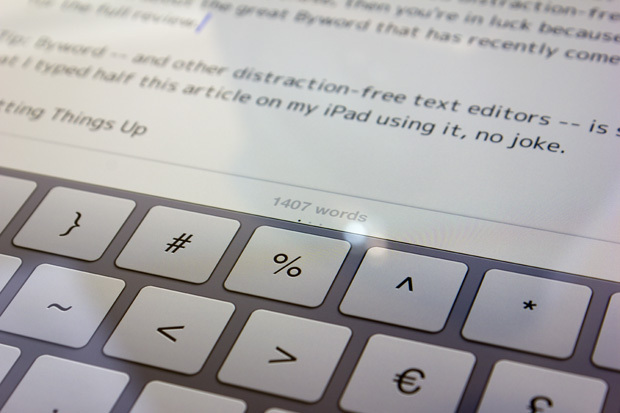 Whenever I’m typing, there is a word count sitting right above the keyboard that really annoys me. There’s an option to hide this on the Mac, so why not on iOS? If I’m desperate, I can remove it by swiping to the left to get the special keyboard, but why must I do that? Lastly, before I leave this section, I’d like to note that the iCloud sync seem to be a bit choppy and sometimes takes a while to actually work. This shouldn’t be happening, iA Writer never has such a problem when I’m using it. Since I have an iPhone, I decided to include a short bit about the iPhone version of this app – it’s universal – so any of you potential users would know what to expect from it. I’ve tried some text editing using it and the display size really poses a huge limitation to its overall functionality. I’ve found that, even in landscape mode, it’s extremely hard to compose something since there are only three lines of text available. It’d be nice if the top bar and special keyboard could be disabled because it would really save some space. Other than that, there are no major issues with the app. I suppose if you absolutely need to do some text editing on-the-go then this would be a viable solution, but it’s definitely not the best one out there. I can’t say that I can recommend Byword because it all depends on personal preference when it comes to these things. 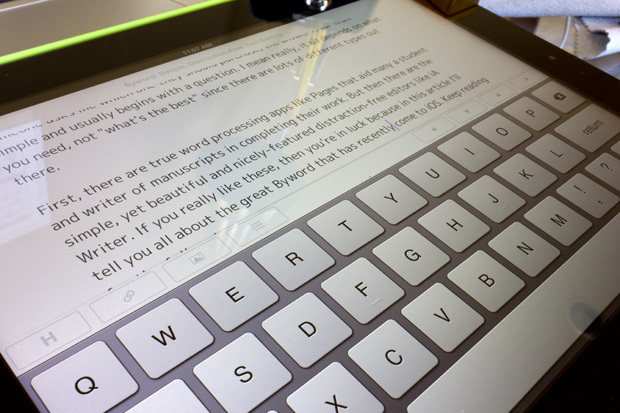 I would recommend it over iA Writer because I believe that iA Writer’s keyboard is too space-taking, the text is far too large for me to concentrate on what I’m trying to say, and the app as a whole lacks customization. 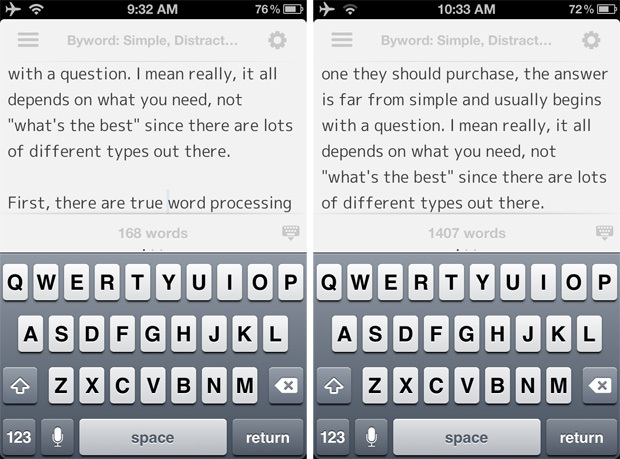 Byword doesn’t distract me as much, which is good since its main purpose is to be distraction-free. One last thing that I’d like to note about this app is that the developers are pretty slow at pushing out updates. The Retina optimization, for instance, took them nearly a month to add, which is a bit ridiculous since the app only has a few elements that aren’t vector – in fact, it only has a few elements in general. So it’s your choice. You’ve read my take on how the app is, but maybe you’ll want to stick with something like the aforementioned Elements instead.